I have learned this the hard way! I would recommend that you let her spit them in the main tank and let nature take its course since they are probably hybrid. 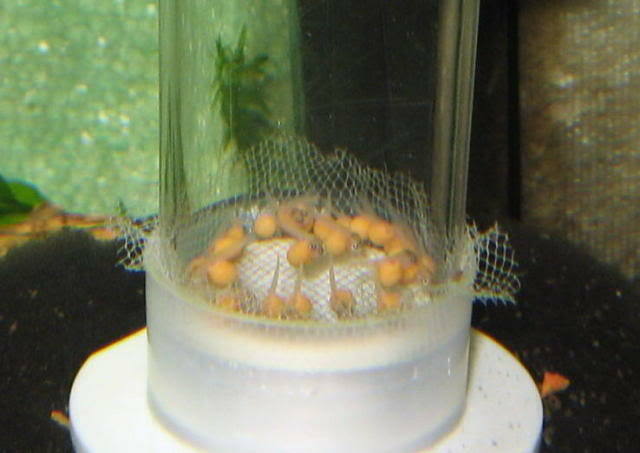 I understand the thrill of the first fish holding and I did the exact thing that you want to do, but it was a huge mistake to save fry that were possibly hybrid. By the time I found out they weren't pure, they had some size to them and I just couldn't put them down. (Too cute, seemed so cruel, etc.) That was six years ago and I still have some of them. I've had to dedicate a 55 gallon tank to keeping the hybrid fry that I've kept or have survived on their own. I did not want to give them to a fish store or anyone that would try to sell them as pure greshakei -- which is what happened to me. To answer the questions, the eggs don't actually hatch. 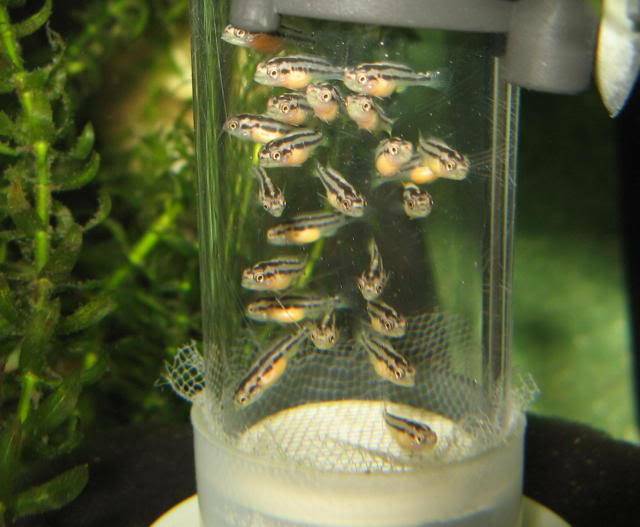 I don't know exactly, but it only takes a few days for the fish to start developing after the spawn. They use the yolk sac up in about 18 to 21 days or so at which point the mom will probably spit them. Here are a few pictures to help you see the development over a short period of time. Your stock includes fish that will be better off if they aren't kept in a tank with mbuna. Are you planning to keep them together long-term? If not, you could add more Labs and experience the thrill of non-hybrid fry soon enough. I have had pure (Auratas) and hybrid (OB Zebra - female / Blue Zebra - male) and was/am excited about both. I gave the Auratas to a friend that was intersted in Cichlids (I gave him instructions as well) and they are thriving! Right now, I have the hybrids - Zebras (I thought I had an all male tank - oops! 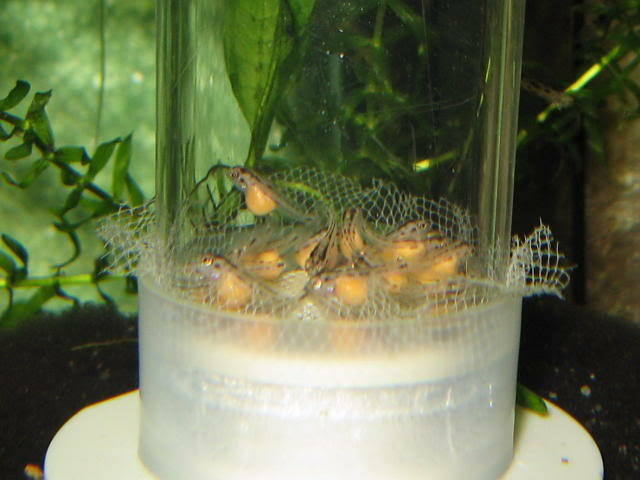 ), and have a friend that is giong to take 4 of them (He has NO intentions of selling them off, I made him promise me...) and plan to start another tank to house the rest. They are only 1/2 inch now, and are eating on their own (spat out on Sunday)... With the parents being what they are, I can't wait for them to color up! It is, in my opinion, solely up to you what you what you do with them, but if you 'pass them on, it is yur responsibility to inform the recipient that they are hybrid fish. DON'T CONTAMINATE THE POOL!!! » How do you space leaf lettuce?